Welcome to the Sixth Street Community Synagogue! 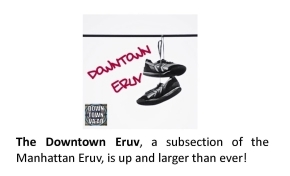 We're a thriving, engaged, and welcoming Modern Orthodox Jewish community in the heart of the East Village. A 78 year old synagogue in a 171 year old building. We like to think we're different. Everyone from the occasionally observant to the traditionally Orthodox feels at home here. We hope you do too. 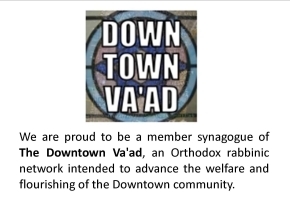 Our community reflects the character of lower Manhattan -- intelligent, diverse, open, and fun -- while still deeply committed to values of Torah, Chesed and Halakhah. We'd love to have you join us for a Shabbat, a holiday, or just a beer. Sixth Street's Annual Mother's Day Kiddush! For $54 you can be named as a contributor. The names of your daughters, mothers, grandmothers, teachers, or virtually anyone you choose, will be listed. Beer fest + Lag BaOmer = Lager BaOmer at Sixth Street Synagogue. The sixth annual event will be a fun time for all craft beer enthusiasts and students of Beer Yochai.